First mentioned in the Eagle as the Union Square theatre on September 16th, 1912 and closed in 1959. Reopened as Paris Cinema on July 18th, 1969 and closed in 1980. 1969 grand opening ad posted. As the Union Square Theatre, it was profiled in the MGM Theatre Photograph and Report project. There is an exterior photo dated April 1941. The photo was taken from the same angle as the color photo posted above on April 4, 2005 by Gerry Deluca. High up on the end wall was a lighted sign with the theatre’s name. Above the entrance was a small marquee with the Union Square name on the frnt and sides. Posted on the marquee in white letters on a dark background is the movie, James Stewart and Paulette Goddard in “Pot O' Gold”. The Report says that the theatre is on Union St., that it is not a MGM customer, that it was built about 1915, is in Fair condition, and has 500 seats, apparently all on one floor. There is a notation that the Union Square Theatre plays non-MGM first-run films. I went to a couple of Saturday kids' matinees at this theatre when it was known as the Paris. I recall there being a short hallway, leading to a concession stand and waiting area, that were seperated from the theatre by curtain covered doorways. The theatre itself was square in shape, with a relatively high ceiling, and wood floors. At that time, the theatre was kept unusually dark; perhaps, to hide the building’s poor condition. Years later, I attended a play at this location, when it was the Berkshire Public Theatre. The interior had been renovated by then and appeared to be in good shape. 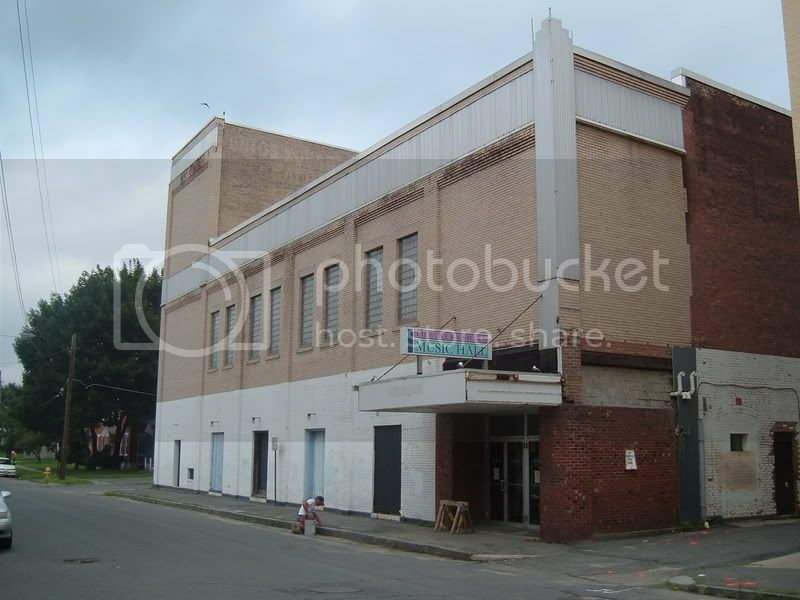 However, from more recent pictures, it appears the venue fell back in to disrepair rather quickly. Throughout it’s various incarnations, the building’s purpose/name was advertised via a second story wall mural that often revieled previous tenants, as the paint began to fade and chip. The Barrington Stage Company, now a summer-only theatre based in Sheffield, purchased the Berkshire Music Hall and the adjoining Octagon House two days ago. The purchase cost $785,000. The company plans to continue renovations begun last year by the previous owner, Raymond Schilke. The status should be changed to “Open/Renovating”, as the theatre is currently in use. The theatre is in fact being currently used for stage shows and other acts. Some are sponsored by the Colonial Theatre restoration organization in order to raise needed funds for that project. I haven’t been inside this theatre yet, but the entrance is an ugly botched mess I hope is eventually improved and made more attractive.